“I’m an artist, a musician, a magician, a writer, a singer; I’m everything. My name is Lee from the African jungle, originally from West Africa. I’m a man from somewhere else, but my origin is from Africa, straight to Jamaica through reincarnation; reborn in Jamaica…” .. .. Lee “Scratch” Perry (born Rainford Hugh Perry, on March 20, 1936, in Kendal, Jamaica) is a Grammy award-winning reggae and dub artist, who has been highly influential in the development and acceptance of reggae and dub music in Jamaica and overseas. He employs numerous pseudonyms, such as “Pipecock Jaxxon” and “The Upsetter”. Arguably the first creatively driven, “artist-producer” in modern recorded music, Lee “Scratch” Perry occupies the highest level of music making – standing comfortably next to pioneers like George Martin, Phil Spector, and Brian Wilson. .. .. Perry’s musical career began in the late 1950s as a record seller for Clement Coxsone Dodd’s sound system. As his sometimes turbulent relationship with Dodd developed, he found himself performing a variety of important tasks at Dodd’s Studio One hit factory, going on to record nearly 30 songs for the label. Disagreements between the pair due to personality and financial conflicts, a recurring theme throughout Perry’s career, led him to leave the studio and seek new musical outlets. He soon found a new home at Joe Gibbs’s Wirl records. .. .. Working with Joe Gibbs, Perry continued his recording career, but once again, financial problems caused conflict. Perry broke ranks with Gibbs and formed his own label, Upsetter, in 1968. His first single “People Funny Boy”, which was an insult directed at Gibbs, sold very well. It is notable for its innovative use of a sample (a crying baby) as well as a fast, chugging beat that would soon become identifiable as “reggae” (the new sound did not really have a name at this time). From 1968 until 1972 he worked with his studio band The Upsetters. During the 1970s, Perry released numerous recordings on a variety of record labels that he controlled, and many of his songs were popular in both Jamaica and the UK. He soon became known for his innovative production techniques as well as his eccentric character. .. .. In the early 1970s, Perry was one of the producers whose mixing board experiments resulted in the creation of dub. In 1973, Perry built a studio in his back yard, The Black Ark, to have more control over his productions and continued to produce notable musicians such as Bob Marley & the Wailers, Junior Byles, The Heptones, and Max Romeo. With his own studio at his disposal, Perry’s productions became more lavish, as the energetic producer was able to spend as much time as he wanted on the music he produced. It is important to note that virtually everything Perry recorded in The Black Ark was done using rather basic recording equipment; through sonic sleight-of-hand, Perry made it sound completely unique. Perry remained behind the mixing desk for many years, producing songs and albums that stand out as a high point in reggae history. .. .. By 1978, stress and unwanted outside influences began to take their toll: both Perry and The Black Ark quickly fell into a state of disrepair. Eventually, the studio burned to the ground. Perry has constantly insisted that he burned the Black Ark himself in a fit of rage, but it has also been said that fire could have been an accident due to faulty wiring. After the demise of the Black Ark in the early 1980s, Perry spent time in England and the United States, performing live and making records with a variety of collaborators. It was not until the late 1980s, when he began working with British producers Adrian Sherwood and Neil Fraser (who is better known as Mad Professor), that Perry’s career began to get back on solid ground again. Perry also has attributed the recent resurgence of his creative muse to his deciding to quit drinking alcohol and smoking cannabis. Perry stated in an interview that he wanted to see if “it was the smoke making the music or Lee Perry making the music. I found out it was me and that I don’t need to smoke.” .. .. Perry now lives in Switzerland with his wife Mireille and two children. Although he celebrated his 70th birthday in 2006, he continues recording and performing to enthusiastic audiences in Europe and North America. His modern music is a far cry from his reggae days in Jamaica; many now see Perry as more of a performance artist in several respects. In 2003, Perry won a Grammy for Best Reggae Album with the album Jamaican E.T.. In 2004, Rolling Stone Magazine ranked Perry 100 on their list of the 100 Greatest Artists of All Time. More recently, he teamed up with a group of Swiss musicians and performed under the name Lee Perry and the White Belly Rats, and made a brief visit to the United States using the New York City based group Dub Is A Weapon as his backing band. Currently there are two feature length movies made about his life and work: Volker Schaner’s “Vision Of Paradise” and “The Upsetter” by filmmakers Ethan Higbee and Adam Bhala Lough. .. .. In 2007, Perry surprised the music world again when he invited “king of party music” and television personality, Andrew W.K., to produce his new full-length album, “Repentance”. 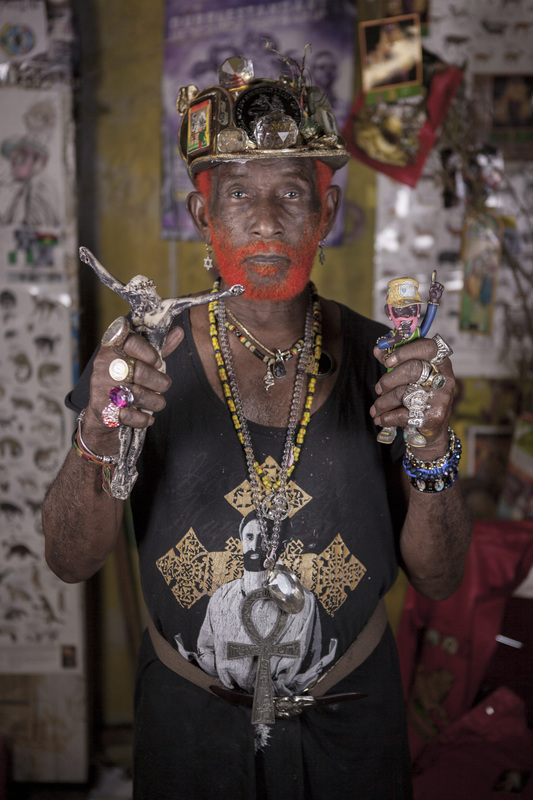 In 2008, Mr. Perry teamed up again with Adrian Sherwood for the release of “The Mighty Upsetter.” .. .. For more information about Lee Scratch Perry, read the excellent authorized biography, .